The Spring Cleaning London is a tradition for centuries and it is still a must for everyone, keen to have a clean and healthy premise. Cleaning your home thoroughly once or twice yearly is a guarantee that the environment in your home is healthy and hazard free. Sanitisatising is very important, especially for families with little children or pets. Our Sprig Cleaning is a perfect cleaning solution for each customer, willing to provide their premise with easily affordable, excellent cleaning service. It is also the best way to have it thoroughly cleaned, tidy and sanitised without having to carry this burden on your shoulders. The service is guaranteed and we do offer a re-clean, free of charge, should the cleaning fails to meet your expectations. 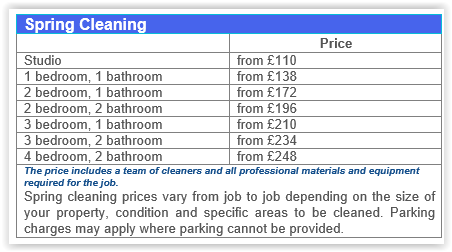 The Spring Cleaning service is not limited in time and the price is based on property’s size and condition. This means that we send you a team of cleaners with all the cleaning equipment and they will stay until your property is thoroughly cleaned; which includes windows from the inside, window and door frames, skirting, tops of cupboards, shelving etc. as well as hovering, moping, dusting and thoroughly cleaning your bathrooms and kitchen. Combine with our professional steam cleaning for maximum effect. We can recommend you to use this service with our carpet cleaning service. Another great service is our deep oven cleaning. If you wish to receive a free cleaning quote, you are welcome to contact our office and briefly describe the premise to our chatty customer assistants. They will be able to give you more information and reply to your enquire. 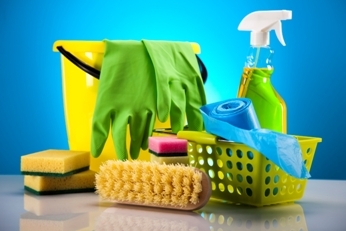 Once you have booked your guaranteed Spring Cleaning with us, you will meet a team of efficient, professionally trained and extremely hardworking cleaners. They will carry the cleaning for you and bring the glamour back to your premise. Do not hesitate to make a fresh start for your home, contact our company today.